Singles of Australian origin looking for romance, love, casual partner or life commitment are welcomed to join Aussiecupid.com.au – a great dating site for personals interested in Australian dating experience. Taking advantage of free Standard membership one can join the site, create profile and brows its numerous photo galleries to get the idea of the site and its services. 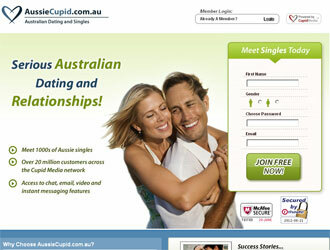 The registration is rather detailed at the site Aussiecupid.com.au, but this makes a part of the important process – the best match selection. More features including e-mail account, messenger and live chat become available for additional cost at higher levels of the membership.